Fall arrived in Kentucky bearing a hint of chill in the air. Which, of course, makes me think of bourbon. While I enjoy bourbon year-round, I especially appreciate its warming qualities during the fall and winter. One of the best ways to appreciate Kentucky bourbon is by conducting a tasting. Below are some tips from the Kentucky Distillers’ Association on how to go about it. But first, you’ll need to decide what to taste. Three bourbons is a good number. You could try a vertical or horizontal tasting – and no, those aren’t references to the position you’ll be in afterward. A vertical tasting is a tasting of products from the same distillery – several kinds of Four Roses, for instance. A horizontal tasting is a tasting of the same type of bourbon or whiskey from different distilleries – three different ryes, maybe. 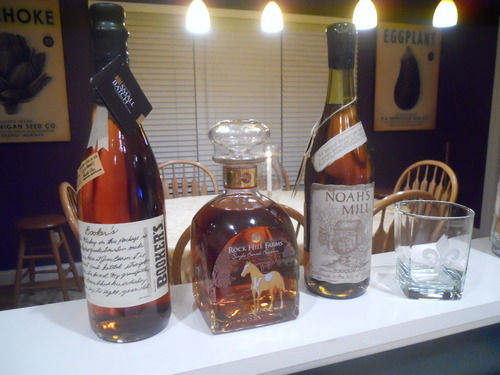 Or, you can do a general tasting of any three bourbons, like the one pictured above. Whatever you choose, it’s best to start with the lowest-proof bourbon and work your way up to the highest proof, so that your tastebuds don’t get overwhelmed immediately. No single bourbon features all of these flavors – so concentrate and see what you can discern. 2. Setting up a tasting is easy. All you need is glassware, some pure water – and, of course, bourbon. Try to use tulip-stemmed nosing glasses (if they’re available) or a rocks glass. Always have a glass of water and salt-free crackers on hand to refresh your palate between sips. You’ll be sampling bourbon at full-strength, so the last point is important. Fill each glass with one ounce of bourbon and you’re ready to go. 3. Evaluate each bourbon on four attributes – appearance, aroma, taste and aftertaste/finish. Appearance: The appearance of bourbon can be used to evaluate its level of maturation. Color is visible proof that it is matured in new, charred barrels that rest in open-rick warehouses. Aroma: Swirl the glass 2 or 3 times and then take 3 short sniffs. (Avoid taking long sniffs as this can be overwhelming.) You should be able to identify a number of different aromas in your glass of bourbon. Taste and aftertaste: You’ll next judge taste and aftertaste (the finish) in a two-step process. First take a small sip, swish it around the mouth for a few seconds and then swallow. How does it affect the palate? Does it explode in a cascade of flavor or does it just affect a limited portion of the palate? Taste again and judge the finish. Is it short or long? Is it dry or oily? Is it warm and pleasant or hot and irritating? 4. At this step, the tasting is officially over – but you might find it hard to stop. Always remember to enjoy your Kentucky bourbon in moderation and responsibly.